Bestselling author Stephen Prothero addresses the question of "Whose America is this," by exploring American political discourse and the significant texts that make up the living history of the American people. American politics is broken because we have forgotten how to talk with one another. Instead of arguing on behalf of of our nation, we argue on behalf of our party. 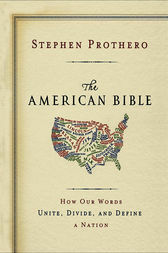 The American Bible: How Our Words Unite, Divide, and Define a Nation reacquaints us with the oft-quoted (and misquoted) speeches, songs, and sayings that animate our politics, inspire social action, and drive our debates about who is—and is not—a real American. It reconnects us with a surprising tradition of civility that manages to be both critical of Americans shortcomings and hopeful for positive change. To explore these "scriptures," is to revisit what Americans have said about liberty and equality and to revitalize our ongoing conversation about the future of the American experiment. Title: The American Bible-Whose America Is This?